A lot of bands play retro hard rock nowadays and the decision to perform a type of music that was originally made even before the musicians were born is perhaps not so odd and alien anymore, because it doesn't seem to matter what bands make at this point since most stuff is in a certain sense already made in one way or another. Very few bands are able to come out groundbreaking and innovating today, as you know, so when a band picks up an old style with integrity and in such a good way as Swedish unit Horisont does I'm definitely not the one to complain about it. 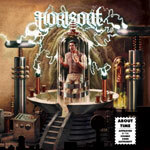 About Time is Horisont's fifth record to date and it further builds on the groove from the most recent work, Odyssey  and Time Warriors . The music on this new record is perhaps a little more soothing overall than on those two records and it also has a clearer sound picture and only one track is sung in their native language this time. The band is able to get a beautiful 70's feel for the most part and lands somewhere right in the middle of being a fresh force of today and being an act of nostalgia, which in this case is nothing but a nice compliment to the stellar job they're doing. Axel Söderberg's voice is often shrill to some degree and sometimes he puts on some kind of semi-falsetto appearance and to me it's a perfect fit to what the group delivers in order to become sort of a single entity. As with quite a lot of singers he maybe doesn't hold one of the world's most prominent voices, in regards to his capacity and the sheer quality of his tone only, but if you look beyond that and look deeper into his performance, it truly complements the music behind him and is highly reminiscent of what vocalists of this type of music came out like in the past. The songs are ultimately really great over the record and the guys have an aptitude for capturing the essence of 40-50 year old rock music as far as it's possible today and they prove that they are able to even make it better than what it once was too, which to me is very obvious when comparing the cover song The Hive to its original late 60's version. It's of course an individual aspect to each person who listens to Horisont, but personally I believe that About Time is the band's finest moment to date.